This week’s blog post is written by Caroline D, the Norfolk Record Office’s first digitisation trainee. She describes the fascinating work she has been doing for the past year and explains about some exciting resources which will be available in the future. After training in both digitisation and digital preservation in the early stages of my traineeship at the Norfolk Record Office (NRO), I decided to focus on digitisation, as I have always had an interest in photography and digital imagery. During my traineeship I have learned to use a Phase One medium format camera as well as a range of small format Nikon DSLRs. I am currently studying for a diploma in professional photography at The Photography Institute. I have also been able to study colour management and 3D modelling. Throughout my traineeship I have been working on a major project to digitise the archive of the Second Air Division Memorial Library. The Second Air Division was part of the Eighth United States Army Air Force, which was stationed in Norfolk and East Anglia during the Second World War. The archive is a fascinating collection of diaries, memoirs, letters, photographs, official documents and sound recordings, detailing the lives and work of American service personnel during the war. As well as photographing the original documents, I have also been involved in the development of a new website, which will host the images. I have done some web design work before, so it was good to be able to develop these skills and get to grips with Adobe Photoshop again, which I hadn’t used in a while. I helped to choose the images for the homepage and navigation pages, and created a number of mock-ups of different layouts for the homepage, to help the project co-ordinators to decide how they wanted it to look. I also helped to write and edit text for the website. 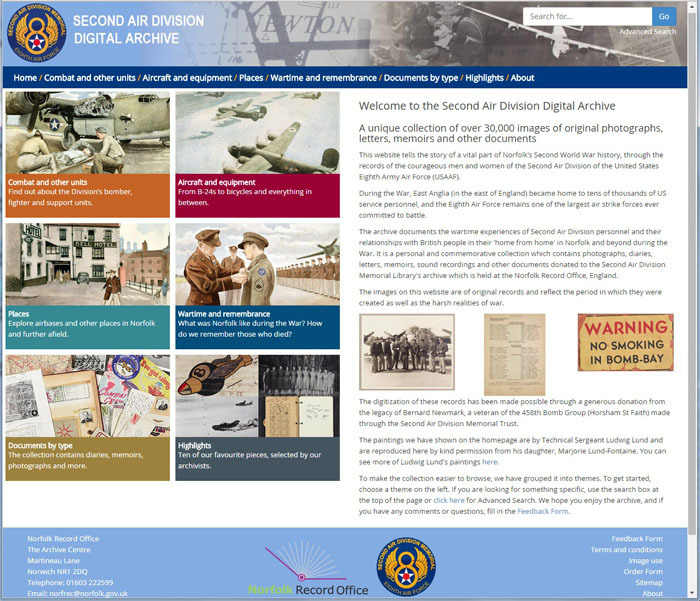 This is going to be a fantastic resource and will enable people around the world (particularly in the United States) to see a wealth of documents online that they could only previously have seen by coming to Norwich. This is what I love about digitisation, it opens information up to a whole new audience and enables people to explore the world in a way they have never been able to before. The website is due to launch early next year – you will be able to find out more information about it on the NRO blog and on our Twitter and Facebook pages nearer the time. I have also been working on a project to digitise a large number of medieval charters on parchment from our archive in King’s Lynn. These charters are incredibly beautiful, but they are quite fragile. Digitising them will allow people to enjoy them without putting the documents at risk. I have been working with the NRO’s conservation team, as the charters have to be flattened as much as possible before they can be digitised – and that is not always easy when they have been folded up for well over six hundred years! 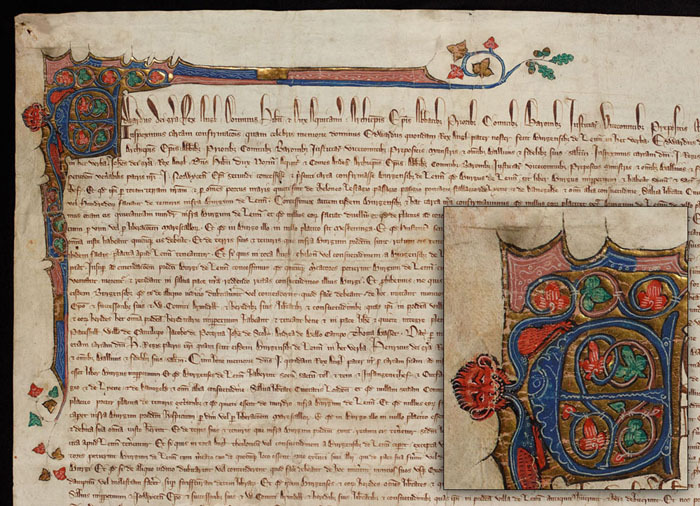 The charter pictured is from the reign of Edward II and is dated 16 May 1313. It is an inspeximus charter, confirming two earlier charters of 1280 and 1307, granting that burgesses (freemen) ‘shall be free in the same manner as their ancestors’. It is one of my favourites; I particularly like the ‘grotesque face’ in the illumination! It has been a great pleasure to work on these historic documents and I look forward to using the skills I have learned throughout the rest of my career. This entry was posted in Behind the Scenes, Snapshots from the Archive and tagged charters, conservation, diaries, digitisation, Edward II, Eighth United States Army Air Force, illumination, Kings Lynn, letters, medieval, memoirs, online, photography, Second Air Division Memorial Library, Second World War, Sound Archive, traineeship, website. Bookmark the permalink.